Live Creating Yourself. : Man, do I love a good deal! 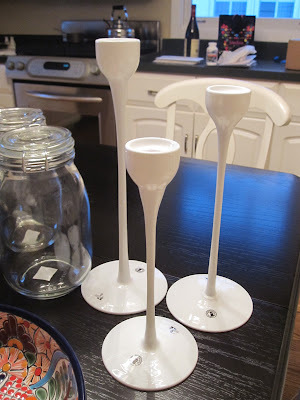 Oh and the white vase next to them was $1 at my local Salvation Army. It's things like that that make me giddy. Ahhh!! Imagine glorious rays of light streaming out of this lamp (more like the Holy Grail, and less like it was plugged into an outlet)! A near replica to my lust-worthy Rosenwald lamp! Snatched that right up, brought it home, and plopped it on my entry table, which coincidentally, is also in my dining room. Gorgeous! I love your style. 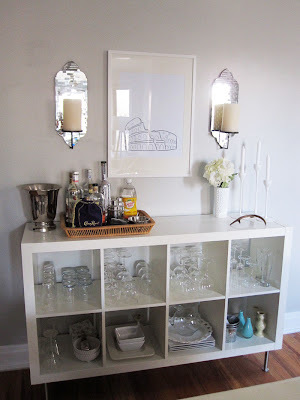 Where did you find those two cute blue vases tucked away on the bottom corner of your didning room bar? They are EXACTLY what I'm looking for! I'm really liking the white and white interspersed with pops o' color! Hi, just found you via City Girl Chicago! 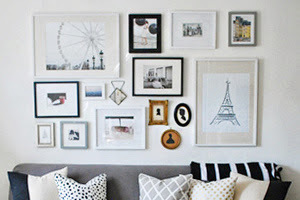 I love your blog and your apartment!! 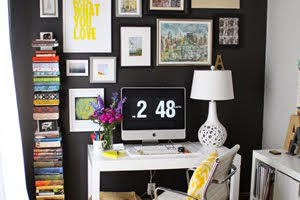 Your office area is gorgeous and you've really pulled off the dark wall! It makes the pictures really stand out and makes the space feel bigger as the colour adds some depth. Very nice design look. Your DR bar is very fresh - I like it! And the lamp is a very good sub for the pricey one. You could easily update and/or change the shade if you wanted to go for the whole look, but I like it as it is just fine! That bar in your dining room is so nice. Is it so stylish. Like all your new finds for it. Looks great. 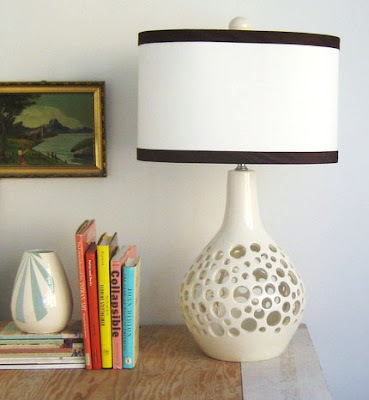 wow, that lamp is exactly my style! loooove it!!! Great lamp! I want one, too. 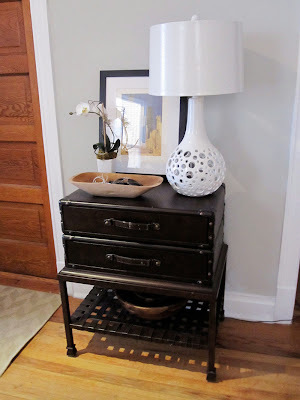 Love the lamp - love a great deal. Your apartment has come together so nicely. You have great taste. Such a steal! Love your new lamp! It looks perfect for it's spot. Also, your office is looking gorgeous! I really love that lamp! I bet you could trim the shade with some black ribbon to more closely duplicate the look. I just love your bar area- it is perfect for a large party!